After a thrilling start to the UIPM Pentathlon World Cup season in Cairo, Egypt cut the ribbon on the UIPM 2019 Global Laser Run City Tour in the historic Mediterranean city of Alexandria. 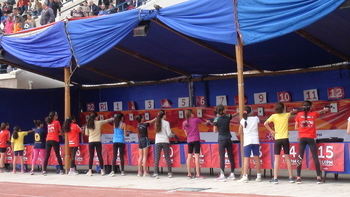 Athletes of all ages from 27 clubs in Cairo, Alexandria and Tanta gathered at Alexandria University to compete, with almost 600 people taking part. Aged from nine all the way up to Masters categories, they ran their laps and fired their laser rounds in 35C heat. Another 100 cities have been selected in 2019 as hosts of the GLRCT or the new Biathle/Triathle National Tour. The full calendar can be viewed at the UIPM website, where you can also find more information on UIPM’s various multi-discipline sports.